In this year’s edition of “Golden Rose” Bulgarian Feature Film Festival, we are proud to present four short movies, supported by Nu Boyana Film Studios and B2Y Productions that have qualified in the official selection. Dimitris Georgiev is a promising young director with projects that have received acclaim on a number of international film festivals. The idea for “The Last 2 Days” comes from a directing task he had to complete for the Bulgarian National Academy for Theatre and Film Arts, where he studies Film and Television Directing. “The assignment was simple – I had to make a 7-minute movie in the suspense genre. However, the project quickly went out of scope and soon I realised that there is no way for me to tell this story in less than 20 minutes.” – says Dimitris Georgiev. Lyubomir Pechev is an experienced director who has a number of formidable projects in his showreel and is always looking for a place to channel his creativity. His work has won a number of awards and has been featured in various festivals, the most notable being Semaine de la Critique 2010 at the Festival de Cannes. Right now he works as a film director at B2Y Productions. “I like telling stories that I have experienced myself. I enjoy mixing genres and I think that in today’s filmmaking it becomes harder and harder to stay consistent with just one genre. During the filming of Trials we faced a lot of environmental challenges – low temperatures, tight spaces and night shoots. But in the end all of this hardship payed off.” – comments Luybo Pechev. Vania Doneva’s Serafim has already won a couple of prestigious awards – Audience Award at ISFF New Wave and Grand Prix at IFTVF Slavic Tale. 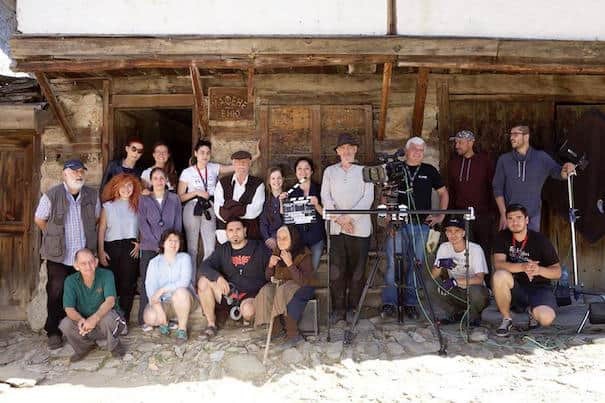 The talanted director feels a strong connection with the film’s origin – the short story Serafim by Bulgarian classical author Yordan Yovkov. “Serafim doesn’t own anything but even so his soul is rich and he gives it way little by little to help people. This is why I have chosen to film this particular story – to tell the pain and belief in the good of people. Pain because nowadays people give only when they get something in return. Belief in the good heart of people, who still care for humanity.” – explains Vania, who is also a graduate of the first Screenwriting and Directing masterclasses at Nu Boyana’s educational centre. The costumes and Serafim’s coat, which is an important prop in the movie, have been taken straight out of Nu Boyana’s extensive wardrobe. The coat has been specially dusted and painted so it can have the same feeling to it as Yovkov describes in his story. Principal photography took place in Dolen village, which still has the atmosphere of the time, needed for the film. “September” is among the first co-productions between Bulgaria and Portugal in terms of a feature film. On the Bulgarian side of the production is Vanya Rainova (Portokal Films) who has been following the project’s development from an early stage, participating actively in the scriptwriting process as well. The entire production was carried out in Portugal, with post-production taking place at Nu Boyana Film Studios, Bulgaria. Director Leonor Noivo studied architecture and photography and holds a BA in Film Directing from Sup.School of Theatre and Cinema in Lisbon, where she specialized in editing and directing. She co-founded the cinema production company Terratreme Films, a directors and producers platform created in 2009. She has directed the films “Aside Macao” in 2001, “Mould” and “InsideOut” in 2005, “Assembly” and “Airport” in 2006, “Excursion” in 2007, “Later Day Saints” and ‘’EB 26” in 2009, ”Other Letters” and ”The City and the Sun” in 2012, and ”September” in 2016. We wish all participants best of luck at 35th Golden Rose Bulgarian Film Festival!